County first-responders Joe Behm (bottom row, from left), Jack Law, Howard Holland, John DiBuonaventuro, Neil Vaughn and Ryan Corcoran (top row, from left) Joel Gramling, Adam Weaver, Shane Clark, and Beau Crowding pose with the Pentagon 9/11 artifacts. 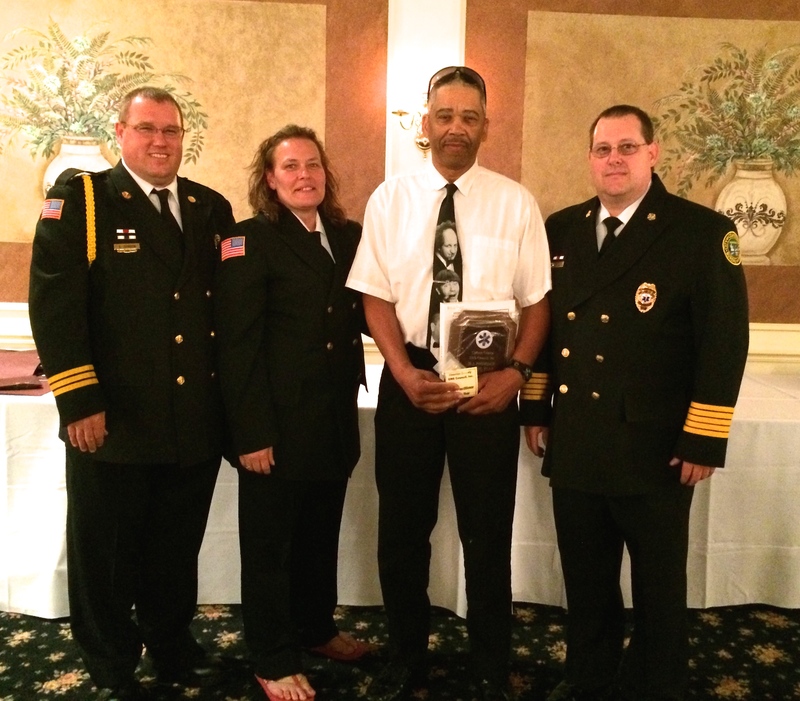 The predawn convoy left Chester County at 3 a.m. Thursday with a 10-member cross-section of county first responders. Its destination: the Pentagon. 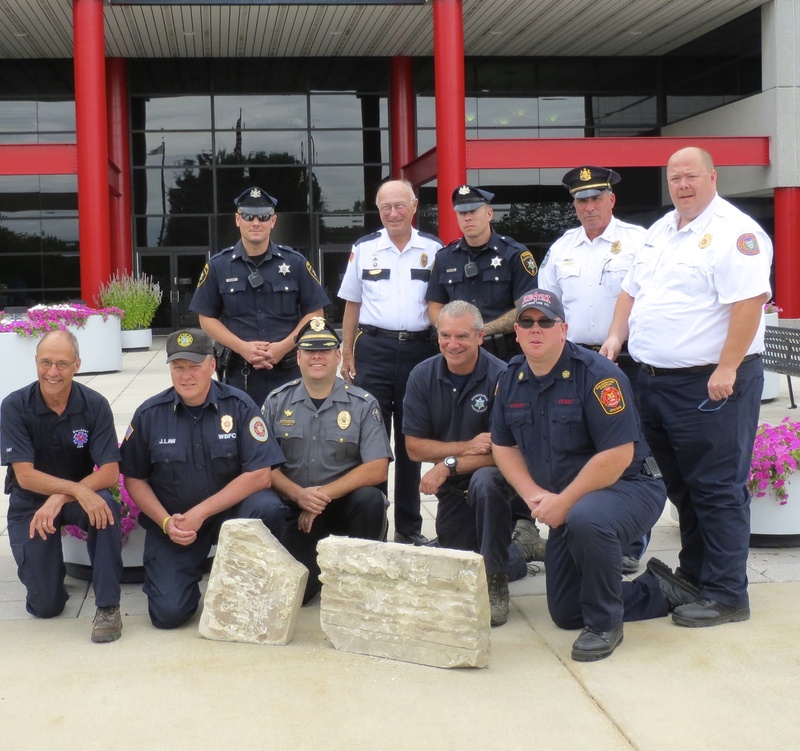 The four-vehicle caravan returned to the Government Services Center in West Chester nearly 10 hours later with poignant new details about what transpired at the Pentagon on 9/11 – and large chunks of limestone to help ensure that county emergency responders would never forget the tragedy. Beau Crowding, the county’s deputy director for fire services, said the artifacts would be memorialized in the four-acre tactical village under construction at the county’s Public Safety Training Center on Modena Road in South Coatesville. The village, slated for completion next year, is the second segment of a three-phase construction project. It started with an education center, which opened in September, and will culminate with an indoor shooting range. 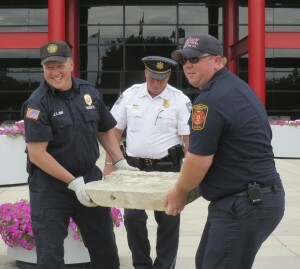 West Bradford Fire Chief Jack Law (left) and Malvern Fire Chief Neil Vaughn hoist one of the stone artifacts as West Pikeland Township Police Chief Shane Clark watches their backs. Crowding said representatives from myriad first-responder organizations would determine how to showcase the artifacts after receiving recommendations from the project’s architect. 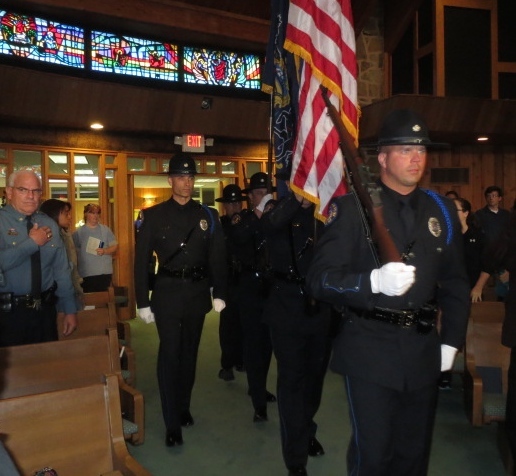 Crowding said they employed the same collaboration when the county obtained a steel beam from the World Trade Center, a girder that had been forged in Coatesville. It now serves as a focal point in the education center, where it towers below a skylight with an American flag as a backdrop. The county was fortunate in being able to piggyback onto a trip planned for some New Jersey first responders through Phila. 9/11 Memorial Inc., Crowding said. The Chester County contingent rendezvoused with the New Jersey group on the Delaware Turnpike Thursday morning and proceeded to the Pentagon, where they met William Hopper, the information and communications manager at the Department of Defense who oversees the artifacts. Crowding said Mike Garcia from the Department of Homeland Security took the group on a tour of the 9/11 Memorial at the Pentagon. Garcia, a witness to the tragedy, discussed what he observed and the role he played that fateful day. Downingtown Police Lt. Howard Holland, a representative of the Chester County Police Chief’s Association, described the tour as “solemn … a lot of lives were lost.” He said he learned that one Pentagon employee had a child on the flight that crashed into the building. He said the tour compressed a lot of compelling information into a short amount of time. “The significance will take a while to sink in,” he said. Deputy Sheriff Ryan Corcoran said the casualties would have been worse if a section of the Pentagon had not been under renovation when the plane struck. He said the stone selection process required some deliberation: He and his associates were able to peruse six pallets, which each contained five pieces. Crowding said they picked fragments that were consistent with the tragedy. One contains black marks; another has some metal embedded in it. Crowding said he was working with Steve Saymon, his Phila. 9/11 Memorial contact, to obtain some soil from the site in Shanksville, where a group of hijacked passengers had managed to detour Flight 93, which had been aimed at the U.S. Capitol. He said the limestone remnants, created by the passenger plane that terrorists crashed into the western side of the Pentagon, would provide a stark reminder of “why we do the training we do” – a fitting tribute to events already etched in stone for first responders. Besides Crowding, Holland and Corcoran, the group included Deputy Sheriff Adam Weaver; Malvern Fire Chief Neil Vaughn and West Bradford Fire Chief Jack Law, who represented the Chester County Fire Chief’s Association; John DiBuonaventuro, accompanied by K-9 Leo, who represented the Chester County Hero Fund; Joel Gramling from the Chester County Fire Police Association; West Pikeland Township Police Chief Shane Clark, representing the Chester County Fraternal Order of Police; and Joe Behm, a member of the Uwchlan Ambulance Corp. representing the Chester County EMS Council, Inc.